Dreamy days begin at the Hale Makamae with a spat of tropical rain and the coo of mourning doves. This is the perfect place to slow down and enjoy all the comforts of home in a sprawling tropical garden lined with palms. Wake up to a gourmet breakfast with an array of fruits to accompany macadamia nut hotcakes and of course, robust Hawaiian coffee. The closest town, Pahao, is a remnant of days gone by with several good eateries. Close to all major attractions that include Volcano Village and hiking trails in the national park, home to the most active volcano in the world, magnificent snorkeling beaches and natural hot ponds for swimming, Hale Makamae is a great home-base for eastern Hawaii’s adventures. 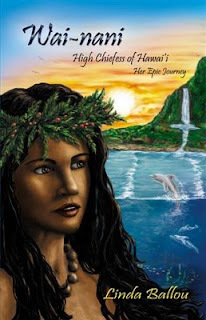 “Wai-nani: High Chiefess of Hawai’i” is, Studio City-based author, Linda Ballou’s layered vision of ancient Hawai’i in historical fiction. Wai-nani’s character is based on the life of Ka’ahumanu, the favorite wife of King Kamehameha the Great, and the novel illustrates ancient Hawaiian culture, customs, and taboos through her eyes. Mixing history, mythology and places familiar to Hawaiian travelers, the novel chronicles the development of Wai-nani from an athletic, tomboyish, teenage girl into a wahine (woman), her travels, and the male barriers she encountered and broke. For those who have visited the Hawaiian Islands familiar places are picturesquely drawn. Ballou’s writing is intense and colorful. Like the waves of the Pacific, the intensity of her images come pounding at every turn, at times at the point of distraction. If traveling to Hawai’i is not within reach this summer, “Wai-nani: High Chiefess of Hawai’i affords an opportunity to visit a land where fragrant plumeria flowers bloom, dancing dolphins play offshore, and a lost echo of sacred culture once more comes alive. Happy hour at the Hula Shores Restaurant is the best place to be when the sunsets over the pearlescent waters in front of Hotel Moloka’i. Locals and tourists gather here for the best Polynesian fruit fusions and pupus on the Island. The lilting voices of local talent singing Hawaiian favorites fills the warm night air. Soon, the bright face of a Hina, the moon goddess, shines through swaying palms. The way it was, still is on Moloka’i. Wai-nani was a joy to read! The action and sense of people and place builds with an authentic sense of ancient Hawaii. You have done an incredible amount of research! You have come across so much information about ancient cultures and implemented it into your storytelling very smoothly. The interaction with the bottlenose dolphins is realistic for those of us who have developed an extraordinarily intimate relationship with them. I can certainly relate to feeling more freedom, embracement and joy in a water environment than a land based living! In my book, Doug Arnott’s Lodge in Hilo is the best budget option on the Big Island. There is a gathering hall for friendly outdoor dining. Choices range from a 2-bedroom apartment with kitchen, a garden suite with a private bath, to a place to pitch your tent. The Lodge is walking distance to great tide pooling and a short hop into Hilo, a happening little burg on the upswing with a fun ethnic mix. Volcano National Park, the incredible Hamakua Coast, Richardson Beach and the Hilo airport are all nearby. This is a handy guide with lots of good information and worth packing if you have a couple of weeks to spend on the Island. With less time, and wanting to get it all in one carry-on bag, I just took notes on a few walks with me. I really wanted to get to the birth place of Kamehameha the Great in Kohala. The directions almost got me there, but neglected to say that only 4 wheel drive vehicle should try to navigate the last stretch to the site which is a dirt road, and I had to turn around. The Mackenzie Beach Park trail was given a bad rap over the bathroom facilities. I thought it was incredible opportunity to stroll in solitude on a dramatic lava bluff with monster waves crashing below. This could just be a case of one woman’s ceiling is another woman’s floor. Many of the walks and hikes are concentrated in the Volcano National Park. I tried the bird walk and it was a delight. Next time, I hope to have more time to explore this lovely region and will take what is one of the best books about hikes on the Big Island available along with me. I met Linda Ballou at the 2009 Los Angeles Times Book Festival. Later, in an e-mail, she told me it took her twenty years to do the research for this historical fiction and to get it out of the drawer and into the streets. The time Ballou spent on this work shows in the rich details that flow like lava from two of the earth’s largest volcanoes found on the island of Hawaii. Wai-nani is rich with ancient Hawaiian culture and lore. The main character may be fictional but she is a reflection of Ka’ahumanu, King Kamehameha’s favorite wife, at one time the most powerful person in the Hawaiian Islands. Today, the Hawaiian Islands may be an incredible tourist destination, but in the 18th century, they weren’t. When the islands were more or less isolated from the rest of the world, the Hawaiian people were often at war with each other and women were second-class citizens who could be executed for daring to eat a meal on the same mat or in the same room as a man. Men could take more than one wife and the rules were strict with death often being the punishment for breaking them. Ka’ahumanu, as represented by Wai-nani in Ballou’s novel, was an early feminist and helped bring about changes that elevated women to be equal with men. Do not be surprised when you find Wai-nani making friends with a family of dolphins. Some readers may have trouble believing this part of the novel, but I didn’t. Before Christ, the Greeks recorded incidents of dolphins helping and befriending sailors lost at sea when their ships sunk. There are recorded incidents of dolphins still doing this in modern times. There have been stories of dolphins driving fish onto beaches to help feed starving African natives. Therefore, it was easy reading about Wai-nani swimming with her dolphin friends in the ocean. Wai-nani also chronicles the clash between cultures when Captain Cook arrives in 1779, along with the same European diseases that devastated and killed so many North and South American Indians. When Europeans started to spread across the globe, their viruses and germs went with them and did most of the killing, making it easier for the land grabs that happened later. That tragedy is part of this story, too. The Hawaiian culture, the characters and the setting are richly detailed. I have never visited Hawaii. It would be nice one day if I had that chance, but if that doesn’t happen, at least I have had the pleasure of being taken to this Polynesian paradise by reading this heavily detailed story. In this small, easy to read book Pali Lee tries to help Hawaiians understand what being Hawaiian really means. Two hundred years ago, disapproving Christians made it illegal to speak Hawaiian, removed all the Hawaiian gods from chants, called the hula evil tried and in general tried to destroy the Hawaiian culture. As a result, Hawaiians took their beliefs underground. In an oral tradition stories are mutated even lost with the death of the ancestors. The earliest accounts were written by Hawaiians who were taught to read and write by missionaries, therefore their vision was clouded by the Christian point of view. I was very excited to find this book and Tales of a Night Rainbow that precedes this effort to unravel a confusing past. I would like to believe this version of Hawaiian history that explains how a generous, fun loving, kind people came to participate in strict class society that called for human sacrifice to war gods and, strict rules enforced by death dealing priests. If you are interested in the genesis of true aloha spirit, read this book.